I went to the pier outside of the Torpedo Factor in Alexandria last night to attempt some long exposure waterscape shots. My goal was to produce some ethereal like scenes found in the works of my favorite photographer Michael Kenna. 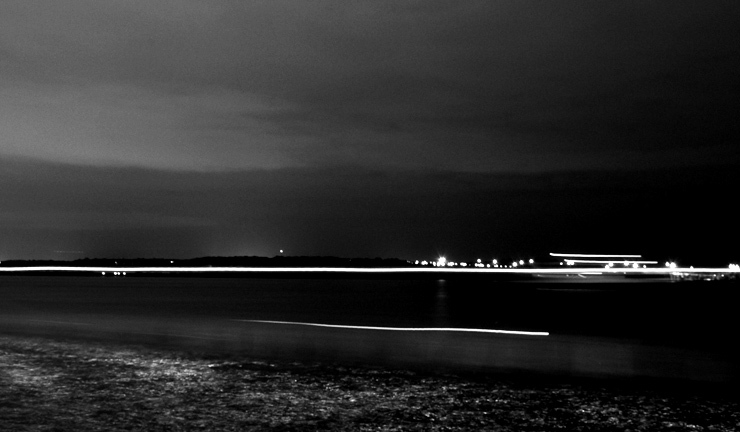 Unfortunately, I wasn’t able to isolate the shots from the surrounding signs of “civilization” such as the blinking lights by the shore and the passing of boats. Also I found that the 30-second exposure limit on my D90 is not long enough to produce a silky mirror surface given the wind factor. Excuses aside, I’m just not good enough yet. Out of all the shots I took I like this particular one, though I can’t really explain why. Some stats: Exposure: 10s, Aperture: f/11, Focal Length: 24mm, ISO Speed: 400. Cropped and resized in Photoshop. The picture has a certain softness to it… I’m becoming more interested in landscape in an art sense over the last few years as I’ve been too busy to really take he camera out of it’s bag very often. I see a lot of these super crisp pretty landscapes that don’t depict anything more than the iconic stark cliffs of the Tasman Peninsula or a significant landmark…. … so I’ve become more interested in sculptural form and looking for some balance in the environment (married to an artist, she’s probably bent my head inside out)… so I’ve been just taking hand-held landscapes and sitting the D90 on the occasional rock exploring that sculpture idea… composition. My MBA ends in about 7 weeks so after that I’ll take those shots and the ideas I’ve been playing with and the camera and the tripod and buy a remote and start working on the technique. Same with skill… I adore some of Tiberio Fanti’s work but have no hope of reverse engineering his work. On page 85-86 of the D90 user’s manual I think with Manual it says that you can hold the shutter open with a remote or manually (when set to Manual only)… for as long as you like. Rather than the timer option. I think next year I’m enrolling part time in a Master of Fine Art and Design, if they’ll have me, to study art Photography – a continual learning thing. I was trying long exposure shots too this weekend too. Was experimenting with the bulb mode using the Nikon remote I bought to get exposures longer than 30s. Nothing worth showcasing yet though I am not sure if you’ve seen some of my old light paintings.